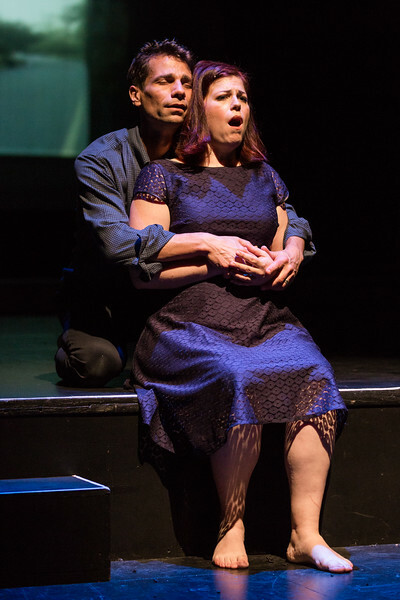 The latest entry to San Diego Opera’s dētour series of intimate presentations is “As One,” the provocative, two-person, 80-minute chamber opera composed by Laura Kaminsky, with libretto by Mark Campbell and Kimberly Reed (Reed also created the accompanying film/video). There are so many moving, touching moments, so many universals in this journey of transition (from Hannah Before to Hannah After) — one bifurcated soul coming together. But the struggles of feeling different, being bullied, grappling with puberty and self-acceptance – these are stages of development everyone can relate to. The music is gorgeously complex and unique, stunningly played by the Hausmann String Quartet, conducted by Bruce Stasyna with nuance and finesse. As the Hannahs, baritone Kelly Markgraf (who originated the role) and marvelous mezzo Blythe Gaissert navigate the score and libretto wonderfully, conveying a wide range of emotions and connections. Their moments of close proximity and physical contact are the most potent. And the humor that courses through the piece is both surprising and delightful. The stark set (Jonathan Gilmer), unfussy direction (Kyle Lang) and beautifully subtle lighting (Chris Rynne) all conflate to create a haunting production that touches you deeply, and makes you think and feel.